Imagine, for a moment, that part or all the Affordable Care Act vanishes from the books—a victim of Republican nominees serving on the Supreme Court or Republicans elected to office after November. I’ll have more to say on this soon, but for now I’d recommend reading Noam Levey’s excellent article in Monday’s edition of Los Angeles Times. 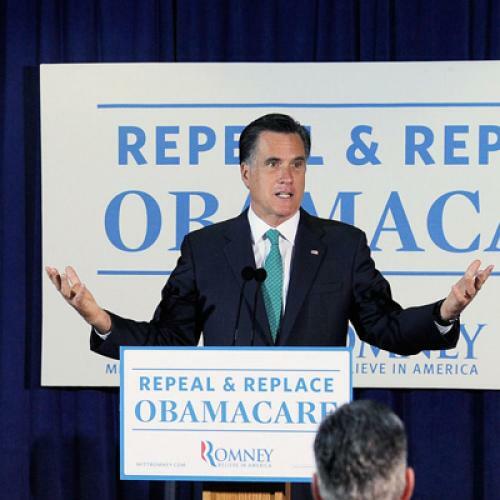 Based on the rough sketch for health care reform that Romney and his advisers have provided so far, Levey concludes that the campaign plan, like proposals from congressional Republicans, would likely leave more people without health insurance, reduce access for people who need coverage the most, and result in higher deficits for the government. This shouldn’t be surprisng. Republicans have been promising to “repeal and replace” the Affordable Care Act ever since President Obama signed it, in March of 2010. But the emphasis has always been on repeal—and for good reason. The Republicans aren’t proposing anything that can replace what the Affordable Care Act would do. Instead, they keep proposing new versions of the same old ideas—like offering new incentives for high-deductible coverage, allowing the purchase of health insurance across state lines, and changing the medical practice system. Some of these ideas have merit: Malpractice reform is a good idea, if it’s done right. (And, in fact, the Affordable Care Act has a pilot program to test some promising approaches.) Some of these ideas have no merit at all: Allowing cross-state purchase of insurance, absent other reforms, would effectively destroy state regulation as insurers, like credit card companies, flocked to the state with the laxest rules. The most far-reaching proposal on the Republican agenda is to change the tax treatment of health insurance, so that group health benefits no longer get a tax advantage. The tax break for employer insurance distorts the health care economy, by giving companies extra incentive to provide benefits and giving workers artificial incentive to demand them. In that sense, getting rid of it is a perfectly sensible idea—if, at the same time, you make other regulatory changes, so that people who no longer get coverage through work are able to get affordable, reliable coverage on their own. The Affordable Care Act, which slowly reduces the employer health benefit tax break while simultaneously creating insurance exchanges with subsidies for the middle class and poor, does this. The Republican plans would not. Stated simply, the McCain plan would (1) dramatically change the way Americans purchase health insurance; (2) incur a large budget cost, at least in the early years; and (3) barely reduce the number of people that are uninsured ... decrease access to insurance for those with higher-than-average medical needs and those at risk of higher medical costs due to their age or past health problems. ... it is possible that the combination of increased risk segmentation and limited financial assistance to the low-income population would lead to an increase in the number of uninsured. Keep in mind that the Republicans, including Romney, are also proposing dramatic cuts to Medicare and Medicaid. Estimates of House Budget Chairman Paul Ryan’s proposal, which Romney has embraced and which would likely be similar to his approach, have suggested that the cuts to Medicaid alone could take health insurance away from between 14 and 27 million people. That’s not including those who would lose out on coverage they stand to get, right now, from the Affordable Care Act. Not that Republicans seem to care much. They like to say their focus is on “cost” as opposed to “coverage.” I’m sure it’s an effective line politically: It suggests that Republicans are focused on the deserving insured, while Democrats are spending their time (and your money) on the less deserving uninsured. But that claim highly misleading. Under the Republican proposals, insurance would become cheaper mostly because it would cover less and would be available to fewer people who need it. Conservatives believe their system would encourage competition, but, more likely, it would encourage the kind of competition we have already: A competition among insurers to insure the least risky beneficiaries, rather than a competition to provide more efficient care to people who actually need medical care. Levey’s article, by the way, makes one other critical and under-appreciated point. Republicans frequently complain that, because of the Affordable Care Act, some people with job-based insurance might lose it, despite President Obama’s promise that people with coverage will be able to keep it. That’s true. But, by transforming the tax treatment of health insurance without accompanying reforms of the insurance market, Romney’s proposal is “potentially more disruptive”and would leave even fewer people with job-based coverage.